Unpretentious and very welcoming, there is a great sense of style about this recently refurbished 18th century farmhouse. 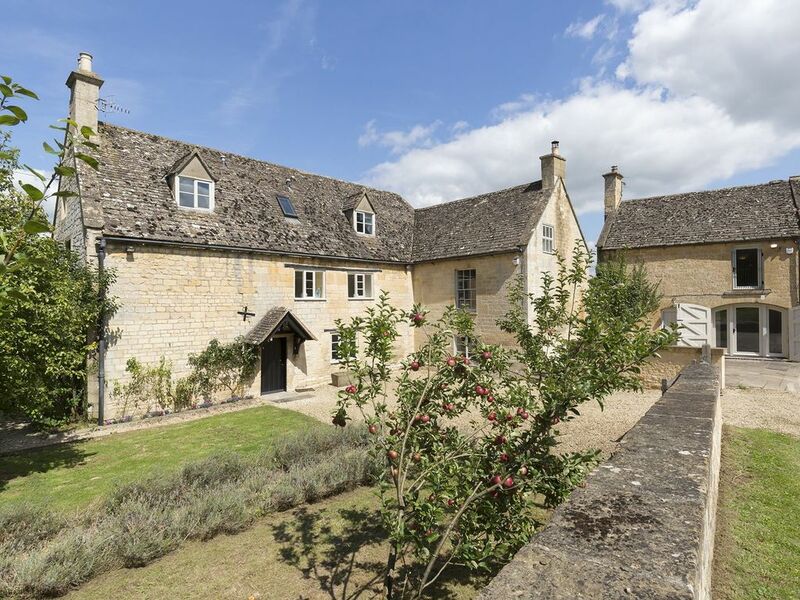 Situated on the edge of the Sudeley Estate, the farmhouse is within walking distance of the village known as the "The Jewel of the Cotswolds", Winchcombe. There are walks and cycle routes on your doorstep and eateries from Michelin standard to local pubs and cafes. Recently refurbished to a very high standard, this house is on the edge of the Sudeley Estate and a stones-throw away from Sudeley Castle & Gardens. Set in Winchcombe, known as the Jewel of the Cotswolds. There are walks and cycle routes on your doorstep. Lots of places to eat in Winchcombe from Michelin standard to local pubs and cafes. ​1 Superking; 2 Kings with ensuite; 2 twins (1 can be double); 1 twin (accessed through another bedroom); 1 King double in annex with own bathroom. Almsbury Farmhouse	Turn onto vineyard street, go over bridge, first left. Plenty of parking 8 cars	Wood store in car park	Annex (2) to the left of the wood store	living room for two, bean bag, kitchen, toaster, gas oven clothes airer, wooden beams, arched doors opening onto courtyard. Front door, turn right into living room turn left up winding stairs leading to twin bedroom with bean bag, dressing table, en suite bathroom with walk in power shower heated towel rail and storage. GROUND FLOOR	Entrance to house, front garden with apple trees and lavender, Cotswold Stone. Entrance Hall with dresser. Turn left into Adult Sitting Room. Turn right into Dining Room. Straight on upstairs with banister is a landing, airing cupboard, book shelves and seating looking out onto courtyard. Adult Sitting Room	2 large sofas to seat 8 people, 2 chairs, decorative fireplace, 65&rdquo; tv, bookshelves with informative and fiction reading, large stool and a cushioned window for reading. Dining Room	Seating for 12 and 2 extra chairs, wood burner, novelty ice buckets, bay window looking onto the Courtyard other windows look to the back garden. Breakfast Room	Wood burner, dining table for 6, sofa and chairs for 4, 40&rdquo; tv, wooden beams, book shelf. Kitchen	Large, extendable island in the centre, Leisure Oven, LG free standing fridge and separate built-in fridge, DeLonghi 4-slice toaster, Russell Hobbs microwave, BOSCH dishwasher, DeLonghi filter coffee maker and DeLonghi kettle, Hanson scales, M&S crockery. Boot/Utility Room	BOSCH washing/dryer machine, BOSCH dishwasher, deep ceramic sink, ironing board, lavatory with heated towel rail. Outside glasses and plates. Snug	wood burner, sofa, two bean bags, 40&rdquo; tv and children's table. Out Building	Boiler cupboard, fuse box, two high chairs. Leads into back garden. Back Garden	Garden table for 12 people on raised decking with retractable parasol. Winchcombe Church in the background. Tiered garden lawn, framed by Cotswold Stone outbuildings and wooden fences. Alpacas in a separate field to the rear - they are wild; don't mistake them for horses and we recommend to to approach them! Front Garden	Sloping lawn with steam at the bottom and the gentle sound of running water. Church and Winchcombe village in the distance. Water trough. Vineyard street to the left. FIRST FLOOR	Green Bedroom	King-size bed, en-suite bathroom with walk-in large power shower and heated towel rail, decorative fireplace, large built-in wardrobe, chest of drawers and looks out onto Front Garden. Family Bathroom	Large walk-in power shower, free standing roll-top bath and heated towel rail. Grey Bedroom	Super King-size bed, decorative fireplace, two large built-in wardrobes, dressing table and looks out onto the Front Garden. Blue Bedroom (en-suite)	Super King-size bed, two large built-in wardrobes, safe, chest of drawers and a rocking-chair. En-suite with bath and shower over bath, double sink and decorative fireplace. SECOND FLOOR	Twin Bedroom (en-suite)	Annex twin, en-suite bedroom. En-suite has bath, hand-held shower and heated towel rail. Twin Bedroom (right of stairs)	Twin beds and desk. Another twin bedroom and games room is accessed via this bedroom; perfect set up for children or people that know each other well. Two beanbags, table and shelves. Eight adults and six children under nine enjoyed their stay at Almsbury Farmhouse. The accommodation was ideal and as child friendly as advertised. Any contact we had with the booking agents was dealt with quickly and efficiently. Comfortable and well equipped property. Sudeley castle is well worth a visit and Winchcombe is a very pleasant. Great location as easy walk to shops but felt like in the countryside. Enjoyed complimentary visit to Sudeley Castle. Lots of space for a family get together which worked well from large dining room, sitting room with huge TV for the rugby and snug adjacent to the kitchen for puzzles and games. Almsbury Farmhouse is situated just off Winchcombe High Street set aside in a quiet location with ample car parking. The cottage itself can easily cope with large group parties having several rooms to relax on the comfortable furniture. The kitchen, bedrooms and bathrooms are well equipped with quality beds and bedding. A short walk to local shops and pubs and restaurants. Perfect for a week away. A beautiful farmhouse, and a fantastic stay ! We loved Almsbury! We've just got back from a fab family gathering at Almsbury Farmhouse. It's really rare that you find a holiday home to rent with such gorgeous interiors and attention to detail. We had such a lovely time in your farmhouse, and particularly enjoyed socialising around the large kitchen island, and lounging in the living room with plenty of board games. The surrounding village is absolutely gorgeous, and the farmhouse is located so conveniently. Lovely walks just outside your doorstep, you barely need to leave the village! Our only small inconvenience was the incorrect keysafe information - a call to the Sudeley Staff quickly sorted this, however - one key between 14 guests gets a little difficult. All in all, we loved our stay, and will definitely be back again soon. The farmhouse is an old, quirky and characterful but with all the modern essentials required for a very comfortable stay. Not for those who are looking for “contemporary accommodation” however it is totally in keeping with the delightfully historic village of Winchcombe and this only served to enhance our stay. We will definitely return at a warmer time of year so that we can continue to explore the area also enjoy the garden and bbq on an evening. Experience Winchcombe and you'll experience the Cotswolds at their finest. Relax in our timbered inns, savour our fresh local produce and browse and buy in our independent quality shops. Soak up the scenery with a walk or cycle around this Area of Outstanding Natural Beauty, or a stroll alongside the River Isbourne. Discover the town's fascinating history and centuries-old architecture, or simply unwind in our breath-taking Cotswold countryside. Book a stay in some of our luxurious and friendly accommodation from where you can visit some of Gloucestershire's top attractions. Train services are available from Cheltenham Spa, 9 miles and Evesham, 11 miles. National Express coaches run from Cheltenham and Marchants Coaches run frequent bus services daily, between Winchcombe and Cheltenham. You can park all day for just &pound;1 in our Back Lane car park, next to The Library, GL54 5PZ, which is just a few minutes' walk along Cowl Lane to the High Street. Bull Lane car park in the town centre, off Chandos Street, GL54 5HX, is a short stay and on Abbey Terrace, GL54 5LL, close to the High Street there is free, two-hour parking. Coach parking is in Back Lane car park, next to The Library, GL54 5PZ.